Unlike last year when the November chinook came with wind and rain, this unusually warm early winter in Fairbanks has been arid with no significant snow in over a month. Skiers are left wishing for even hoarfrost that might cover a month’s worth of birch seed and leaves that litter the Birch Hill trails or provide some structure on the ice-covered Smith Lake. Trails in some areas of Birch Hill are approaching 100% organic, but, other trails are much better. In fact, trails look better at night or slightly out-of-focus, like this photo taken today on the South Tower loop. 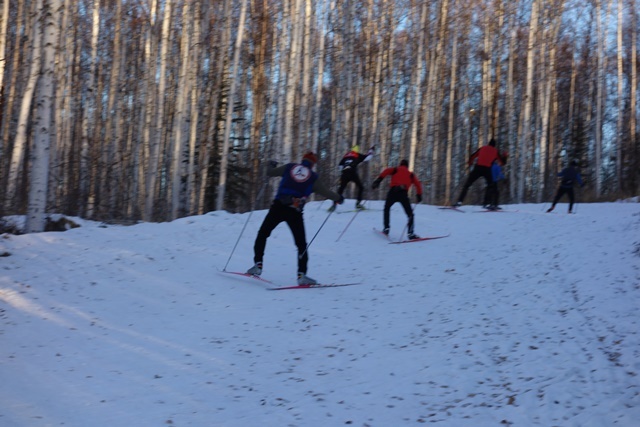 So enjoy the ski trails that we have, and do some cross training. As Pete Leonard pointed out to his FXC Masters Group, most Masters skiers would make significant improvements in their skiing by adding regular strength training. Here are some links to Swedish and Russian Cross Country skiers doing strength training that might motivate you to do the same while snow conditions are less than ideal. This entry was posted in Training Ideas and tagged Birch Hill Recreation Area, FXC, snow drought, strength training by Sonot Kkaazoot. Bookmark the permalink.